It sure has been a while since I played along with the Cupcake Inspirations Team. I've still been doing a lot of behind the scenes work, but I haven't had much time to craft with the Sweeties! Here I am today for a challenge I surely could not miss! 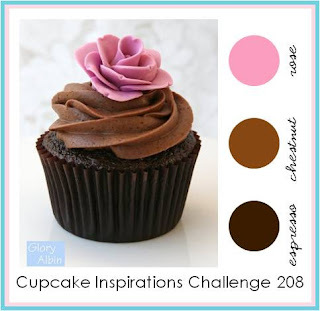 This week, we're playing a color challenge with Espresso, Chestnut, and Rose. Lovely! I interpreted the colors with Stampin' Up! 's Early Espresso, Soft Suede and Rose Red. Our generous sponsor this week is Stampotique and they sent me this lovely Garden and Wild Flowers Background Stamp. It looks like it could be a page out of a book, so I decided to really make it look like one! I started by tearing the edges, then crumpled the page up a bit. I smeared a little ink along the edges and a bit around the words, then sprayed a little Smooch Spritz. The sparkle is subtle and doesn't photograph well, but I love it. :) I added a layer of Early Espresso embossed with the wood grain folder underneath my "book page," then layered on my elements. First, part of a doily (actually recycled from my experimenting with the my bridal shower card), a die cut using the Labels Collection Framelit (my current go-to product) and some Soft Suede DSP (polka dots are my fave!). Then I added some Natural Trim Ribbon and frayed the ends for some texture. The Stippled Blossoms are the perfect touch, stamped in Early Espresso and VersaMark on Rose Red card stock, then heat embossed with some clear embossing powder. The sentiment is part of one from Oh, Hello, combined with a die cut "you" from Papertrey. What do you think? Don't forget to hop over to Cupcake Inspirations to check out all the lovely cards that the rest of the Sweeties have created! Then make your own card using the color inspiration and link up! Can't wait to see what you create! Absolutely gorgeous, Nina! I love the background stamp/book page.